Dosage & Administration: The initial daily dose is based on weight: 0.1 per 0.2 mg/10 pounds to be administered daily, either at once or in morning and evening installments. 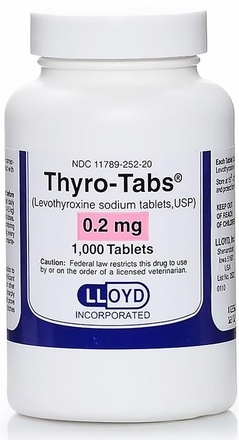 This dosage is then adjusted according to the response in the dog’s blood. Thyro-Tabs are to be taken orally, either directly or together with food. Possible side effects: There are no side effects in most cases. There can be differences when the pet has a preexisting heart condition; consult a veterinarian regarding these risks.